The following is a guest editorial from The Boston Herald, written by one of Boston’s radio show hosts. This angry essay gives you some understanding of the depth of many Americans’ disdain for Ted Kennedy. He did the most to tarnish the Kennedy legend, that huge myth his thuggish father worked so hard to build. If ever there was a “poor little rich boy” it was Teddy. Only he was also the evil little rich boy from his early years, including dishonor at college. Mohammod Youssuf Abdulazeez was another of those “naturalized citizens,” like the Joker, Nidel Ayyad, Ali Mohammed, Khalid Abu Al Dahab. Under Ted Kennedy’s immigration system, others jihadis collected green cards: Mahmed Abouhalima, Mohammed Saleh, Diddig Ibrahim Siddiq Ali. Ed Driscoll wrote an obit at the time of Kennedy’s death in 2009. But to get a real feel for the visceral hatred most Americans feel for this man and his “legacy” read the comment section at the link. People don’t forget the real villainies of the privileged. America is becoming infamous for her traitors. 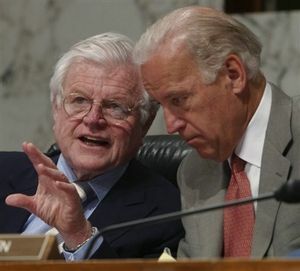 Ted Kennedy ran in the front lines of that slavering wolf-pack. This entry was posted in Counterjihad, Domestic terrorism, Enrichment, Immigration, News, PC/MC, Politics, USA by Dymphna. Bookmark the permalink. I remember the immediate aftermath of the Boston marathon bombings. In order to forestall the jumping to the conclusion concerning the ethno-religious background of the bombers, it was reported that the suspects were of ‘caucasian’ appearance. Too right. They turned out to be from the Caucasus! As he lay dying, Kennedy allegedly begged a priest or bishop to do whatever it took to keep him out of Hell. It would be interesting to know which unrepentant sin stood out most in his mind. It would be even more interesting to know (though I seriously doubt it) if his guilt involved policies he helped institute as a senator. When I was quite young my mother told me that Ted Kennedy was trying to absolve himself by causing others to suffer under his immigration policy. The bigger question in my mind is why have we allowed these destructive immigration policies to continue? Will anyone come forward to say STOP! No one has said anything about it yet (and I will be surprised if they promise anything concrete) because to say and not do it will be the mother of all broken campaign promises, and to say and try to do it will lead to leftist pre-fab sit-ins, rioting and bloodshed that we haven’t seen since the late ’60s, if ever. Leftists seem to think their blood will never be spilled. I find that strange.